Expand to 98 photos (19 cars) found with exterior color of "highland green"
(from page 8 of the 1968 Collection) Highland Green 1968 Mustang GT with 230 hp (at 4800 rpm), 302 cubic inch, 4 barrel, V8 engine. 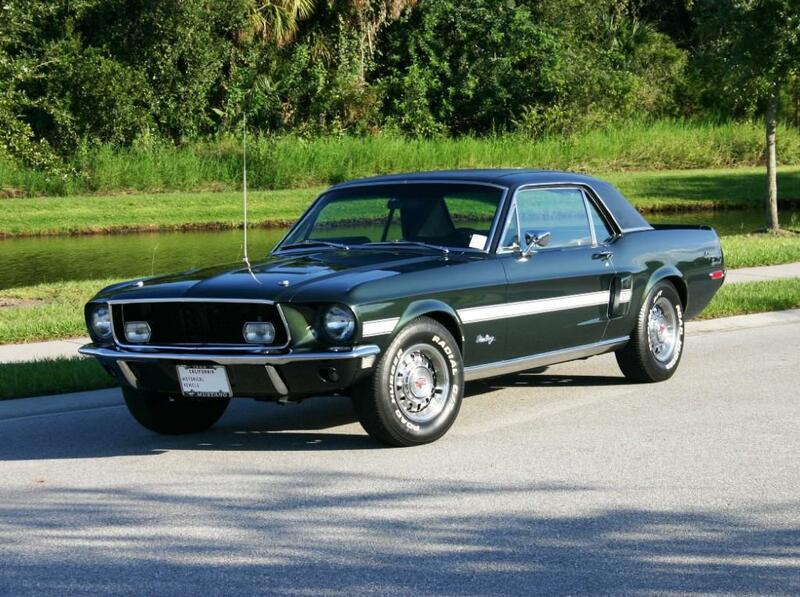 (from page 21 of the 1968 Collection) This is a Highland Green 1968 Mustang California Special hardtop. They are also called GT/CS cars. Steve McQueen drove a Highland Green 1968 Mustang GT fastback in the movie Bullitt. This one is an original code-R Highland Green Mustang, with code 2A black interior, date code 29C March 29th 1968 build, ordered by code-71 Los Angeles district, code-2 rear end with 2.79 gears, and a code-W C-4 automatic. (from page 21 of the 1968 Collection) Highland Green 1968 Mustang California Special hardtop, left front view. Those fiberglass side extractor scoops are standard on the California Special. The grille is also blacked out on these cars. (from page 21 of the 1968 Collection) Highland Green 1968 Mustang California Special hardtop, rear end view. The taillight panel and lights are the same as on a 1968 Shelby. (from page 29 of the 1968 Collection) Highland Green 1968 GT California Special hardtop with Argent style GT wheels, black vinyl top, metal rocker panel trim, fog lamps, side scoops, GT/CS side stripe and graphics, and an emblem-less front grille. This photo is available in two wallpaper sizes; 1024-768 wallpaper and 2400-1600 wallpaper. (from page 53 of the 1968 Collection) Replica of the 1968 Highland Green fastback GT 390ci V8 from the Steve McQueen movie Bullitt famous for its car chase through the streets of San Francisco. This Ford promotional photo has Steve's son Chad driving, and is our Attitude Of The Week for the week starting March 4th, 2012. (from page 53 of the 1968 Collection) Another cool shot of the Highland Green 1968 Bullitt Mustang replica with American Racing Torque Thrust wheels. (from page 53 of the 1968 Collection) Here is the Highland Green 1968 Bullitt Mustang next to its 2001 version. (from page 55 of the 1968 Collection) Have you seen the 1968 movie called Bullitt staring Steve McQueen and this Highland Green 1968 Mustang GT fastback? If you haven't, you better go out and get the movie and watch it. The movie has the best car chase scenes ever filmed. The scene featured this Mustang chasing two hit-men in a black 1968 Dodge Charger R/T 440 Magnum. It was 9 minutes and 42 seconds long. Speeds exceeded 110 mph and Steve McQueen did most of the actual driving! 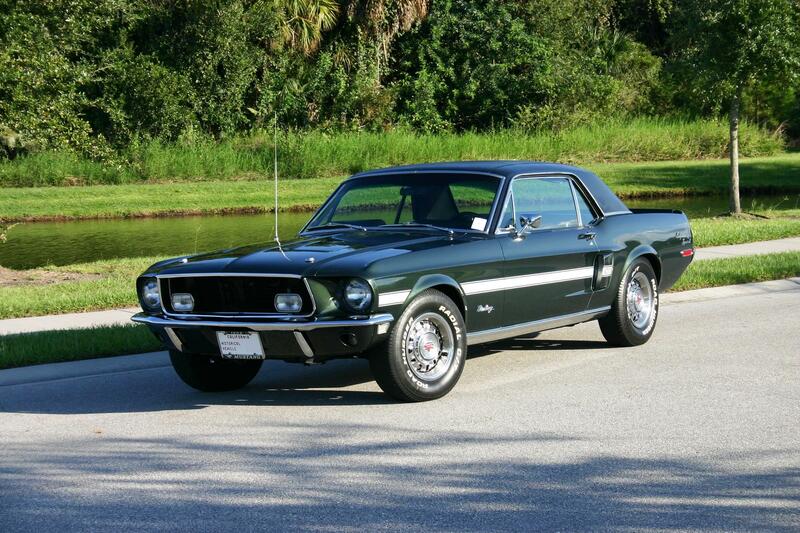 (from page 55 of the 1968 Collection) Two Highland Green 1968 Mustang GTs were built for the movie. One was destroyed during the movie. The other is rumored to still be around but stashed away from the public eye. They were originally modified for filming by Max Balchowski. They received GR70 tires mounted on 15x8 American Racing Torque Thrusts, heavy duty springs, Koni racing shocks, and added reinforcing braces for the inner fenders. Each car had 390ci 4V engines tweaked for higher performance. (from page 55 of the 1968 Collection) In this shot Steve McQueen is trading paint with a 1968 Dodge Charger R/T in the movie's big chase scene! The chase ends soon after this shot with the Charger flying through a gas station and blows up. The Mustang is suppose to be a GT, but I don't see the exhaust cut-outs in the rear valance. (from page 55 of the 1968 Collection) Here is why the Bullitt movie car was built with heavy duty shocks and springs. (from page 55 of the 1968 Collection) This Bullitt movie car was restored. The paint is flat. It was originally scuffed to a flat appearance for the original movie shoot. (from page 63 of the 1968 Collection) This Highland Green 1968 Mustang Bullitt tribute fastback was at the 2010 Mustang Club of America Grand Nationals held in Bellevue, Washington.